Despite Sen. Ted Cruz’s marathon speech lasting more than 21 straight hours, the Senate has moved forward on a temporary spending measure, allowing for Senate Democrats to amend the bill and restore funding for Obamacare. Amid the Senate action, the Obama administration released data today that provides the first look into predicted rates for those purchasing insurance through federally run exchanges. The release has the administration touting that premiums will cost less, but disputes still remain over the plan’s overall costs. Tonight, U.S. 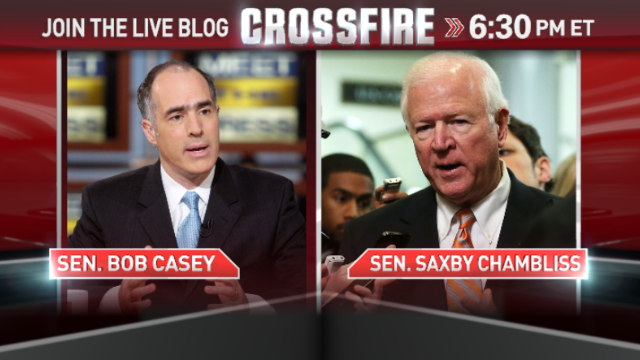 Senators Saxby Chambliss, an Obamacare opponent, and Bob Casey, a supporter, join hosts Stephanie Cutter and S.E. Cupp to break down the costs associated with the controversial health care law and the political impact of Sen. Cruz’s big speech. We want you to weigh in. Do you think that Sen. Ted Cruz’s all-nighter was worthwhile? Vote now by responding Yes or No below, replying to our tweet, or commenting on our Facebook post. I have been watching Crossfire since it has aired. For the most part I have enjoyed the show. What has bothered me as of late (on multiple episodes) is the behavior of Stephanie Cutter. She consistently talks over her guests so badly that I wonder why she has the guests on at all if we cannot hear what they have to say. I expect this behavior from some guests but not a host. I am sure she can agree that when you can't hear the dialogue from either side there is no point listening. I will give it another week or so and this behavior continues I will stop watching. I will never watch Crossfire as long a you have Newt. He is one of the most corrupt people I know and unlike a regular thief, he betrays our trust (like most politicians). CNN is becoming more and more like Fox News. You used to be almost 'fair and balanced'.